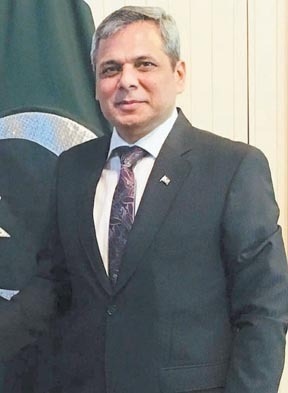 LONDON: Pakistan’s one of the senior most and experienced diplomat Mohammad Nafees Zakaria arrived in London on Monday and assumed the charge of the office of High Commissioner for Pakistan to the United Kingdom. He arrived in early hours on Monday from Kuala Lumpur and without having rest; he took the charge and started working in his office. Nafees Zakaria’s diplomatic career spans over three decades. 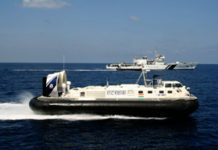 Prior to his current assignment, he was serving as the High Commissioner for Pakistan to Malaysia. Besides serving on various diplomatic assignments in Abu Dhabi, Jakarta and Bangkok, Mr Zakaria also served as Deputy High Commissioner in London and Consul General for Pakistan in Toronto. The High Commissioner holds degree in B.E. (Electronics) and did Master’s in International Relations. He is highly respected diplomat and acclaimed the appreciation for his dedication to work which he always considers as mission to boost the image of his country. He was very popular in general and particularly in Pak diaspora during his tenure as Deputy High Commissioner in London and a number of farewell receptions were hosted in his honour. During the speeches, everyone expressed sincere wish to see him back as a high commissioner. Since, this dream came true, his countrymen are delighted and satisfied on his appointment at this prestigious and significant post and assured their full cooperation. Meanwhile, welcoming his comeback, when the ‘The Nation’, asked him his priorities, Mr. Nafees Zakaria said that this is a challenging task given to him and he shall try his best to accomplish it with the close cooperation of Pak diaspora. “Pakistan is going through a testing time, new government of PTI is trying hard to overcome the challenges confronting from inside and outside both”, he said adding that we all have to work hard to boost the image of Pakistan and effectively encounter the propaganda lashed out by the enemies of the country. “I shall meet with the community soon and will keep close liaison with them as I had been doing and believe in close coordination”, the high commissioner vows. “I appeal Pak diaspora to invest in their homeland since the country needs it meet the financial target and to make economic situation stable”, he said. “Kashmir is on top of priorities and we shall not leave any stone unturned in highlighting the Kashmir issue on all international forums. This is purely a human issue not controversy of land and I did a lot with the cooperation of Pak diaspora in this regard and do hope to get the same gesture and cooperation to raise the voice for oppressed Kashmiri people who are our brothers and sisters in Islam”, Nafees Zakaria emphasised. “The forthcoming Kashmir International Conference to be held in London on 4th and 5th February would be a milestone in Kashmir history and we shall work together with Kashmiri diaspora and British parliamentarians to make these relentless efforts successful and effective”, he stated. “Another important issue is Brexit, we have to avail this opportunity in national interest as other countries are doing. 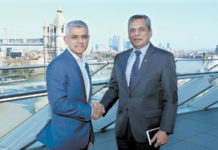 I shall meet the Pakistani businessmen and entrepreneurs and ask them to make strategy to be benefited and increase the trade between the two countries”, Nafees Zakaria said.